After dedicating 30 years to feeding Connecticut's hungry, Nancy Carrington is retiring at the end of the year. Under her leadership, Connecticut Food Bank grew from a grassroots volunteer organization to the largest source of charitable food donations in Connecticut. Summer is a stressful time for families who must provide an average of 200 extra meals for their children during the school break. 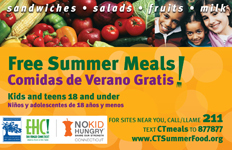 Free summer meals are being offered throughout the state. 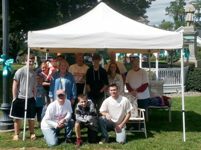 Wolcott Food Pantry works with local schools to inform families who receive free or reduced price meals to visit the pantry over the summer. Volunteers are needed at our East Haven warehouse to inspect, sort and pack perishable food for distribution to feeding programs. School's Out Summer Hunger Food Drives every Friday! Join 99.1 WPLR and Star 99.9 as they team up with People's United Bank and Stop & Shop to fight summer hunger. 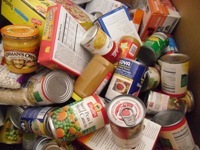 Food drives are every Friday in July at various Stop & Shop Supermarkets. Click here for 99.1 WPLR and here for Star 99.9 food drive times and locations. Nonperishable food items are being collected at the four-day outdoor concert.